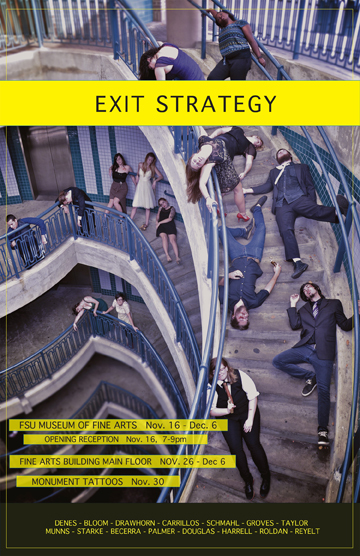 Please join us for the public reception and opening of the FSU Art Fall Graduating Artists exhibition next Friday, November 16th, 7-9pm. 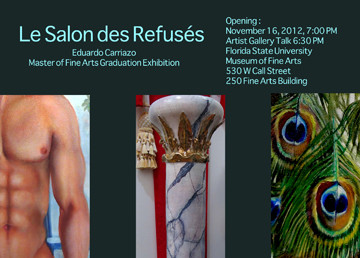 The FSU Art Faculty Exhibition, By All Means, is still up, too. (up until 11/18). The exhibition runs from the opening on the 16th through December 7th @ NOON. If you haven’t yet seen the Faculty Annual “By All Means” it will be open through Sunday November 18th. MUSEUM HOURS: M-F 9-4 S & S 1-4. The Museum will be closed November 12, 22-25 and December 2.